Morning traders. Yesterday was quite quiet for me on the trading front, because I have been working on my volume profile analysis video library for members. 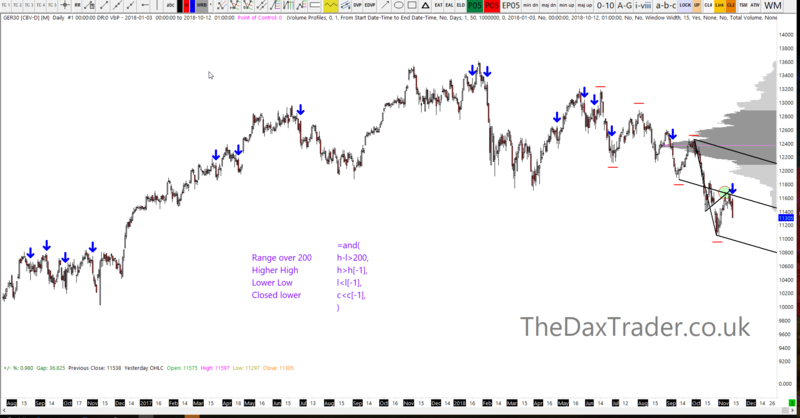 I have also been working on fine tuning my Dax, FTSE, DOW and EuroStoxx strategy to be able to share it with members who are Sierra Chart users. So to summarise the day yesterday, we closed -2% lower after seeing a bearish wide-range-outside-bar on the daily chart (I have written a little about wide-range-outside-bars below), Brexit and Apple weighed on sentiment. The volume profile analysis video library will be a comprehensive collection of tutorials sharing my methods and techniques around the use of volume profile analysis. It will start from the basics and the fundamental framework, including the terminology and progressively build on it through to the more advanced techniques. The idea is to help members improve their understanding of how these excellent tools can help to analyse opportunities. This will be added to the member’s ‘academy’. The strategy I am referring to above is the “DaxTrader Scalper” strategy. This is a momentum-based strategy built using various indicators and studies including keltner channels, moving averages, oscillators, volume and vwap. 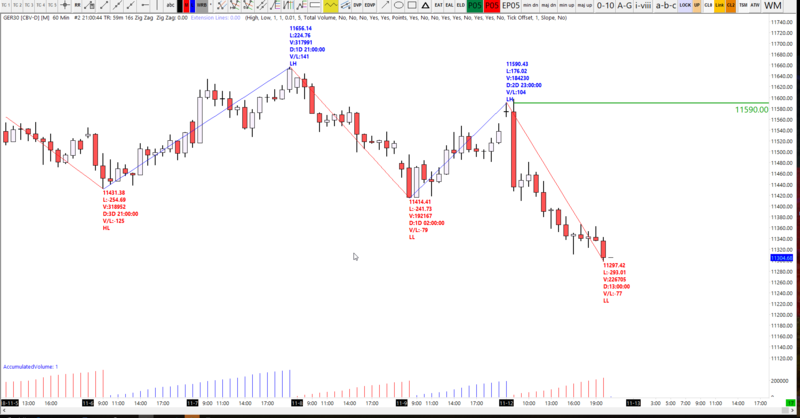 The strategy is designed in Sierra Charts and the chartbook will be made available to members (Sierra Charts required). The chartbook will be protected and the settings will not be available for modification. The member’s page will broadcast a live stream to the strategy, so you can keep an eye on the setups as they evolve. The makings of the downtrend are now in place on the hourly chart. There is now a clear series of lower lows and lower highs. 11400 was the key level to be broken, so perhaps a retest of that area from the underside is the general expectation. The large hourly candle (formed early yesterday) was not retraced very much, and the 11400 level was taken out shortly after, so the intent from the sellers is also very clear. I would expect for them to defend that 11400 level. The European Union’s chief Brexit negotiator Michel Barnier said on Monday that “the parameters of a possible [Brexit] agreement are very largely defined” but still lack support from political leaders, the Financial Times reported. Speaking at a meeting of ministers from the EU’s remaining 27 member states that lasted until late last night, Barnier said that he is ready to present the main points of the nearly finished withdrawal agreement to the UK cabinet on Tuesday. Despite saying that the final agreement is not yet there since “the final stretch is always the most difficult,” Barnier hinted at a possible breakthrough in talks which are now “at an extremely sensitive moment.” “The smallest public comment from my side could be exploited by those who want the negotiation to fail,” the diplomat said. Shares of Apple tanked over 4% on Monday after Lumentum Holdings Inc. slashed its earnings and revenue outlook as it received a request from “one of its largest industrial and consumer customers for laser diodes for 3D sensing,” known to be the Cupertino-based company, to “materially reduce shipments” during the fiscal second quarter. United States Treasury Secretary Steven Mnuchin talked with Chinese Vice Premier Liu He over possible easing of trade tensions ahead of G20 meeting in Buenos Aires, the Wall Street Journal reported citing officials briefed on the conversation. The phone call placed on Friday did not lead to a breakthrough but it shows that the two sides are trying to find a solution for the trade dispute, the officials said. United States President Donald Trump implied several times during his midterm rallies that he believes China is ready to make a deal with the US, despite $250 billion tariffs on Chinese imports. Trump and Chinese President Xi Jinping will talk on the sidelines of the G20 summit at the end of this month. A mortar missile fired from the Gaza Strip directly hit a bus in southern Israel, the Israeli Defense Forces (IDF) reported on Monday, adding that the emergency sirens were sounding across the south of the country and that its fighter jets have started “striking terror targets throughout the Gaza Strip.” According to the Israeli media, the bus was destroyed in the town of Kfar Aza close to the border with Gaza, while one person was wounded as a result of the assault. The incident comes a day after the Israeli aircraft targeted a senior member in the Hamas military wing inside the Gaza Strip and reportedly managed to kill him. Additional six Palestinians were killed overnight during an IDF special forces’ operation in Gaza, while one Israeli soldier was killed and one injured. Israeli Prime Minister Benjamin Netanyahu decided to cut short his trip to Paris “due to security incidents in the south,” his office stated.